I have always been fascinated by the amount of floral variation we see in the winter growing geophytes of the Cape. Take Nerines for example, why is it that Nerine sarniensis is red, whilst another Nerine species, Nerine ridleyi is pink? What is even more striking is the amount of floral variation within a species. For example, why do some populations of Nerine humilis have long styles and filaments, whereas these same floral traits are shorter in other populations? The answer lies with the pollinator the flowers attract. If different floral forms are associated with different pollinators, the more important question to ask is; what is the underlying mechanisms behind pollinator adaptation and why is it important to study those mechanisms? Well, if floral variation is potentially a precursor to the formation of new plant species, then the study of the mechanisms giving rise to floral variation may provide insight into the origins of species (processes that are potentially lost once species formation is complete). 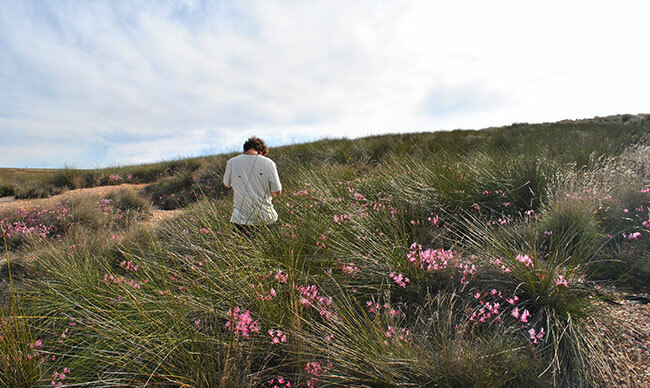 Above: Short style Nerine humilis growing on a quartz patch close to Haarwegskloof Renosterveld Reserve with Stuart Hall conducting pollinator observations in the background. Nerine humilis was introduced to me by Bruce Anderson following a field trip with John Manning in the Southern Cape. The inspiration for this trip followed the discovery of a very unusual form of Nerine humilis with exceptionally long filaments and styles on the foothills of the Langeberg mountains near Suurbraak. The purpose of the trip was to find the pollinator of this long style form of Nerine humilis. If flowers serve as an advertisement to pollinators for a reward, then one can assume that the long styles and filaments are adapted for pollination by an insect with long mouth parts. As explained to me by Bruce, this is exactly what they found. While walking back to the car, they heard the loud buzz of a Nemestrinid fly, happily sipping away at the long style flowers. The fly was later identified as Prosoeca longipennis; a large grey fly with a proboscis up to 5cm in length. Above: Prosoeca longipennis visiting the long style form of Nerine humilis at Nuwekloof pass, Baviaanskloof. Further research into this pollination system revealed that the distribution of the fly is in fact very patchy and localized. Since Nerine humilis is a widespread species it is only natural to assume that outside the range of the fly, it is expected to be pollinated by a different pollinator and have flowers adapted to those pollinators. The typical short style Nerine humilis variant was found flowering later in the season and were visited by pollinators with short proboscis which included honeybees, butterflies, wasps and solitary bees. The pattern we observed at this stage was one where there was an association between different pollinator communities and style length. To determine whether this pattern we observed was in fact a result of local adaptation of plants to pollinators, we tested this hypothesis using an experiment where we translocated cut inflorescences from a short style population to a long style population and vice versa. If local adaptation was evident, we expected that the introduced phenotypes should show a decrease in seedset compared to phenotypes occurring naturally. Our findings following the experiment were consistent with the above. Long style phenotypes produced more seeds than short style phenotypes in the long style population, and short style phenotypes produced more seeds than introduced long style phenotypes, in the short style population. This result was exciting, however, we faced one problem. The problem that the results may reflect the fact that pollinators may have never even visited the introduced inflorescences to start with. Therefore, it was important to test the actual mechanism behind the observed local adaptation. We tested whether local adaptation is a result of the preferences of pollinators or the mechanical fit between flower and pollinator morphology. We tested this idea by offering pollinators choices between phenotypes and we found that pollinators showed no statistical preference for native flowers over introduced flowers. However, what we did find when we offered pollinators flowers that had never been visited before (virgin flowers), is that more pollen was transferred onto stigmas of native virgin flowers than introduced virgin flowers. This pollen deposition also followed seed set where native forms experienced more seed set than the introduced forms. Very similar to the original results from the reciprocal translocation. This suggested floral variation in Nerine humilis is likely the result of local adaptation to the morphology of the pollinator, amazing! Newman, E. Manning, J. C. and Anderson, B. 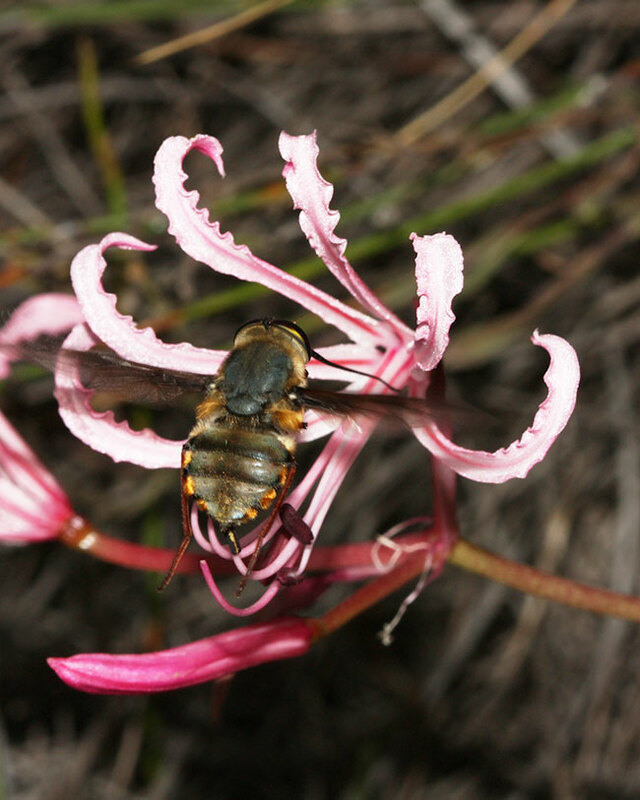 Local adaptation: mechanical fit between floral ecotypes of Nerine humilis (Amaryllidaceae) and pollinator communities. Evolution. 69: 2262 – 2275.